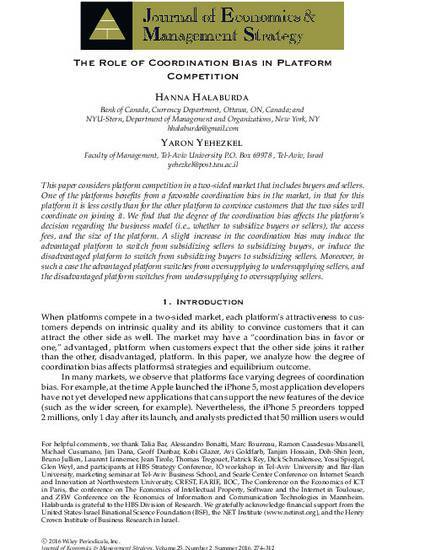 This paper considers platform competition in a two-sided market that includes buyers and sellers. One of the platforms benefits from a favorable coordination bias in the market, in that for this platform it is less costly than for the other platform to convince customers that the two sides will coordinate on joining it. We find that the degree of the coordination bias affects the platform's decision regarding the business model (i.e., whether to subsidize buyers or sellers), the access fees and the size of the platform. A slight increase in the coordination bias may induce the advantaged platform to switch from subsidizing sellers to subsidizing buyers, or induce the disadvantaged platform to switch from subsidizing buyers to subsidizing sellers. Moreover, in such a case the advantaged platform switches from oversupplying to undersupplying sellers, and the disadvantaged platform switches from undersupplying to oversupplying sellers.